Brixton 1986 by unknown artists. Household?. A day's shopping on the wall! As the trains rumble through Brixton train station, how many people look through the station doors to see an array of market stall products painted onto the back wall? If you decide to get off and take a peek you will see not one but two murals displaying the sort of wares you could buy in Brixton market 25 years ago. The first mural is painted onto boards and hangs over the passageway that links Station Road to Atlantic Road. It displays a cornucopia of goods - framed pictures, fruit and veg, fabrics, necklaces - an eclectic mix. People must wonder what part of the market sells these goods! We have guessed these murals to be dated around 1986 when there was a million pound refurbishment of the station. Not only did it include two murals, but bronze sculptures by artist, Kevin Atherton, were created to stand on the platform. 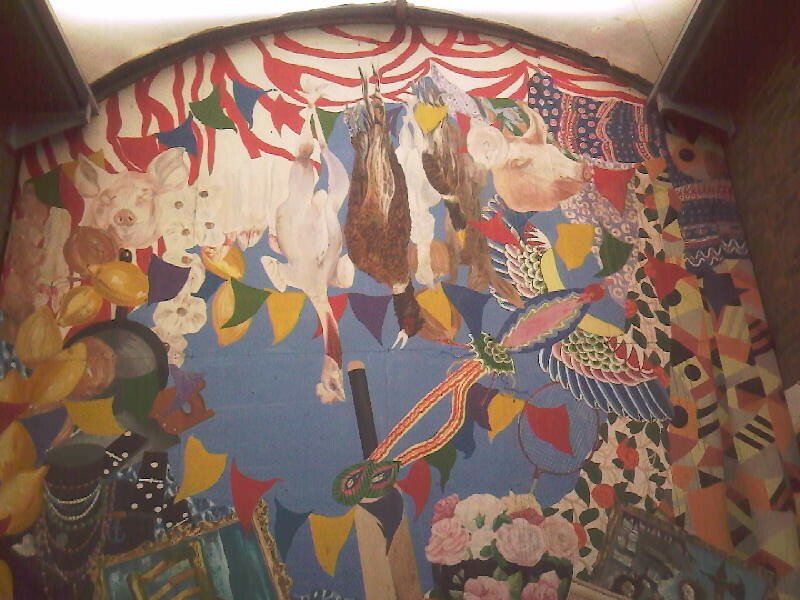 So if we took our time machine to visit 1986, not only would be see a sparkly new station with public art but we could pop out to the market and we would find a block of thriving second hand stalls whose products were the inspiration for the massive still life mural. The artists who worked on both pieces are Karen Smith and Angie Biltcliffe who were working under the name Anchor Designs. They had previously been involved with works on Stockwell Park estate which have now gone. As the shopping habits of Brixton have changed so much, this mural stands to remind us of the old market of the 1980s, in particular the second hand market which has been gone for at least ten years. This shows again that murals can become a snapshot of local life in all its forms. The murals are painted on boards. They have not got a varnish covering so any mess that fulls down the front would not be easy to remove. However, being inside, they are in good condition. Take a train to Brixton Railway station. If you are coming from Victoria, you will exit through the main station and see the mural. If you are coming from the other direction, exit down the stairs. When you reach the bottom, you will see a passageway. Walk into this and you will spot the murals.